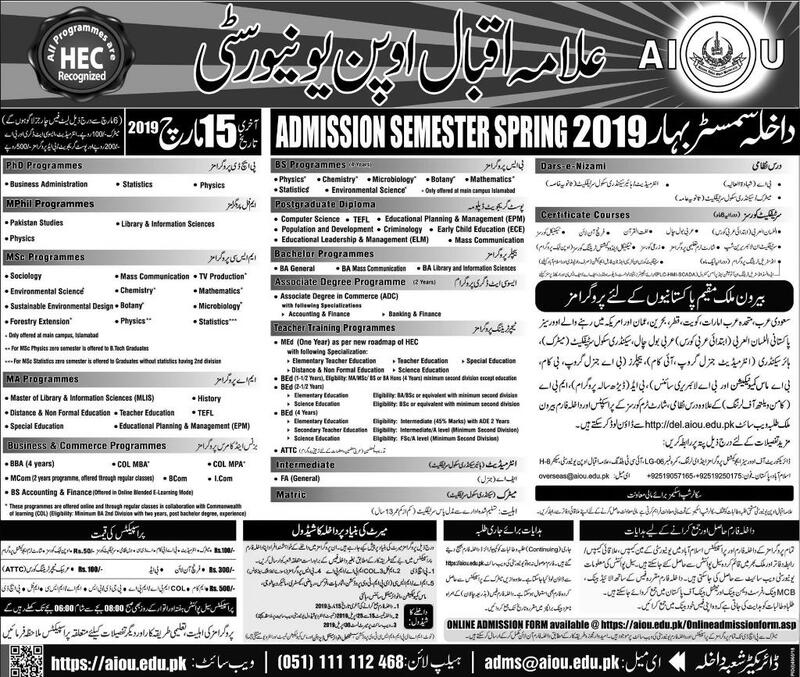 Allama Iqbal open University AIOU announced the Admission 2019 spring/Fall Semesters. Students those want to get the admission in the Allama Iqbal open university they have now the opportunity to get the admission 2019 nowadays because admission are announced recently for the spring semester. Application form for the admission spring 2019 has been updated you just download the application form regarding your required program and then you fill the application form attach the 4 photographs Copy of CNIC attested testimonials domicile copy and fee deposit slip and send all of these documents to the aiou admission office. Once your admission process will be done then you will get you books (courses) very soon because aiou admission department will deposit you the books to your home address. AIOU Admission schedule and dates are also provided at this page. You must apply before the deadline because after the last date aiou will charge double fees for the admission. Allama Iqbal University admission 2019 fees Structure for each course by year new criteria are provided. Allama Iqbal Open University is the one of Biggest Distance learning University in Pakistan that is providing the International Education System and its offering now various programs e.g MSc, MCom, BSc Honor Program, Commonwealth of Learning MBA, MPA and MA as well. Admission schedule of continue student is same as that for new students. These students are sent continuing admission form by post on their mailing address before the commencement of admission period. However if any student does not receive continuing admission form it can be downloaded from the website in Download Section. Download Prospectus for details of programs from link below. Download Admission Form from the link given below. Attach attested documents and photo with Admission Form. Deposit Processing fee in authorized banks branches of MCB bank (Branches List) on challan form and attach with Admission Form. Schedule for submission of Admission Form with Rs.500 Processing Fee. Admission Form with Rs.1000 Processing Fee. Send Admission Form after depositing processing fee complete in all respect to the following address, Directorate of BASR Room No: 106, Project Directorate Building, AIOU,H-8, Islamabad.